Icon alert: this post is about Mesa Arch, a major icon which many now scorn and avoid as a subject of landscape photography, and which is known to have the crowd these days. I’ve photographed a few icons over the past 30 years, although many of them are underwater and so the landscape buyers probably don’t even think of them as icons, or even think of them at all. Mesa Arch is one of the landscape icons. 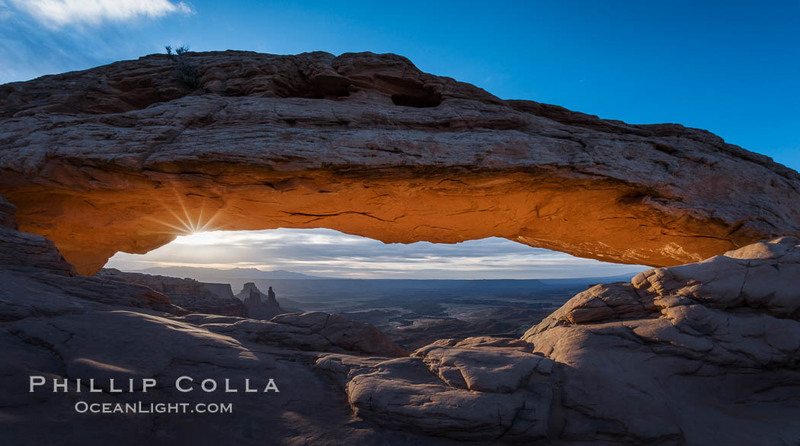 It’s hard to break new “visionary ground” at a place like Mesa Arch, of which hundreds or thousands of photographs are made each day, almost all of them within a short of period of +/- 20 minutes of sunrise. I first visited Mesa Arch in the 90s, and first made a meaningful photograph of Mesa Arch in 2007. 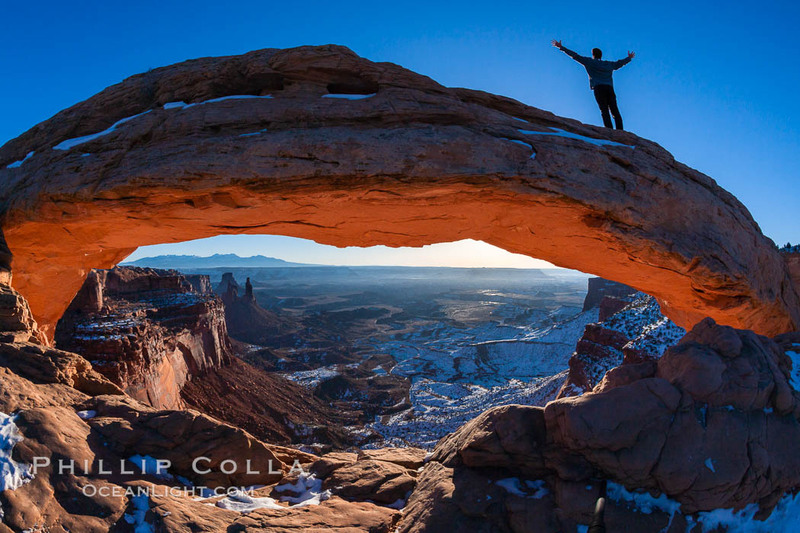 Standing on the arch with arms spread, enjoying the cold winter sunrise in solitude while hovering over a yawning canyon, I made an image that ended up taking a first in a national competition and has since been licensed a number of times, paying for the trip several times over. It has a serious flaw in it that I somehow overlooked at the time I shot it — no, its not the model in the shot — but nobody has really mentioned it when they have looked at the high res. I’m glad I was using the Canon 1DsII for all my photography at the time, since the resolution of that mainly studio and fashion camera has held up well over the years, and the sharpness of the Canon fisheye with which I took the shot will cut fingers if one is not careful. Mesa Arch, Utah. An exuberant hiker greets the dawning sun from atop Mesa Arch. Yup, that’s me. When I decided to return to Arches and Canyonlands a few years ago, I wanted to make a different image of Mesa Arch, one that I had thought about for a while: the Milky Way arcing over Mesa Arch. So I did it. Getting the lighting the way I wanted it was a challenge, and stitching the resulting very-wide image without distortion affecting it took some time, but in the end I was very happy with the result. I used a mix of equipment brands in order to produce the highest quality image I could: a Canon 5D Mark III which was new at the time and exhibited great image quality at high ISO settings, combined with the Nikon 14-24 lens, then and still the best all-purpose wide landscape and astrophotography lens available. 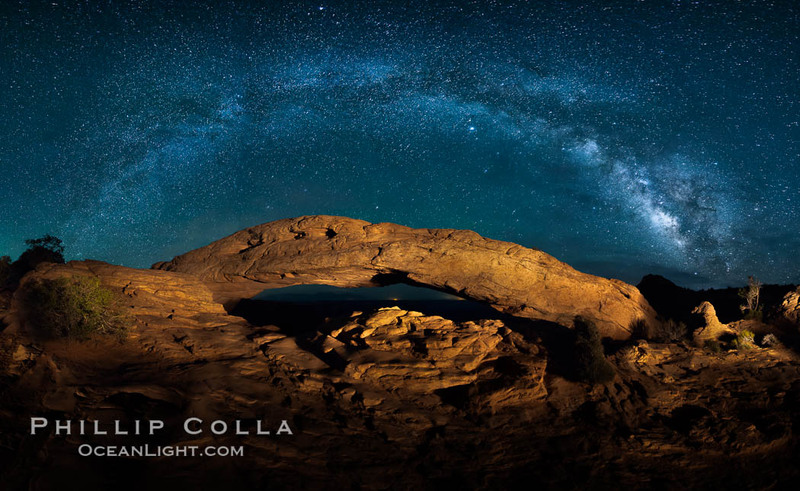 I believe this image was the first of its kind at Mesa Arch at the time it was made, and the composition has since been repeated a number of times, especially in the last year with its burgeoning interest in astrophotography and the popularity of the online image duplication factories 500px and Flickr. During those years I had never seen another person at Mesa Arch. Not at night, not at sunrise, not during the middle of the day. I had heard rumors about the crowd from other photographers, and as pros changed from providing images to providing travel services and workshops in the early 2000’s, I heard the comments more and more: the testy workshop groups and solo photogs with crossed-up tripod legs all hoping to get one for the bucket list, the rock climbing hipsters wanting to walk the span of the arch just when the light was good, and the busloads of foreigners making a 10 day whirlwind tour of the entire southwest while allotting just 30 minutes to see Mesa Arch at the moment of sunrise before running off to Arches for the rest of the morning. I knew someday I would encounter the crowd and kind of wondered about how it would be. My expectation was that the crowd would be a bummer but given these are our public lands — shared lands to which we are all equally entitled — and that we all are tourists (including photogs) at a place like this, I figured it was just something to be endured and hopefully would be fun. Last month a buddy and I spend 5 days in the Moab area running around with our cameras, shooting some night images, making a few hikes, and seeing the icons. It was great! 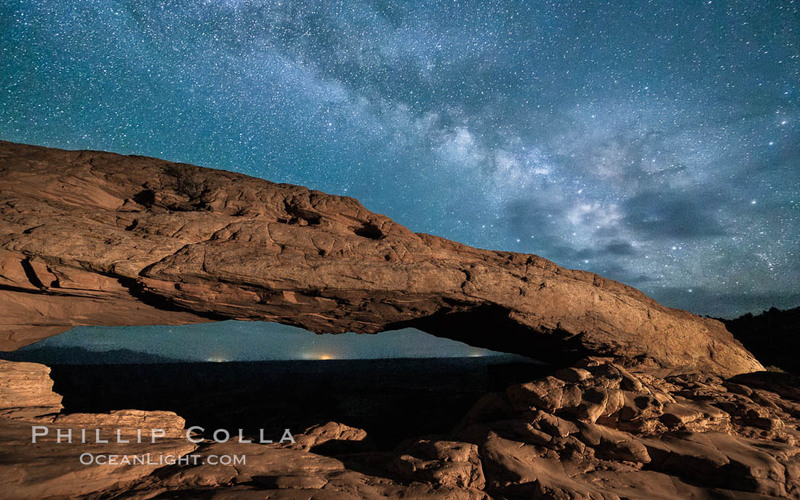 We did make a few new night images to be proud of, and photographed a couple icons along with everyone else … including Mesa Arch, the classic morning shot which I had never really made before. I do get requests for a sunrise image of Mesa Arch. I’m not sure why I get such requests, since there are many photographers who have this in their stock files and can provide a beautiful print. But I wanted to make sure I could fulfill such requests, so I photographed the arch with two cameras (Nikon 14-24 and Nikon fisheye) in order to provide a couple alternatives. Garry McCarthy and I arrived at the arch first that morning, but my record of having solitude at Mesa Arch was soon broken: about 30 other people eventually arrived to enjoy the spectacular view. So now I’ve experienced the crowd the Mesa Arch, and it was not a bad thing. Everyone wanted to see the same magic light illuminate the underside of the arch, glimpse Washer Woman Arch in the distance, and feel the dizzying vertiginous pull of the cliffs just a few feet in front of us. I heard a number of accents and languages all expressing excitement when the sunlight hit the rocks, and joy when they realized their camera had captured the scene nicely. It was a great morning.